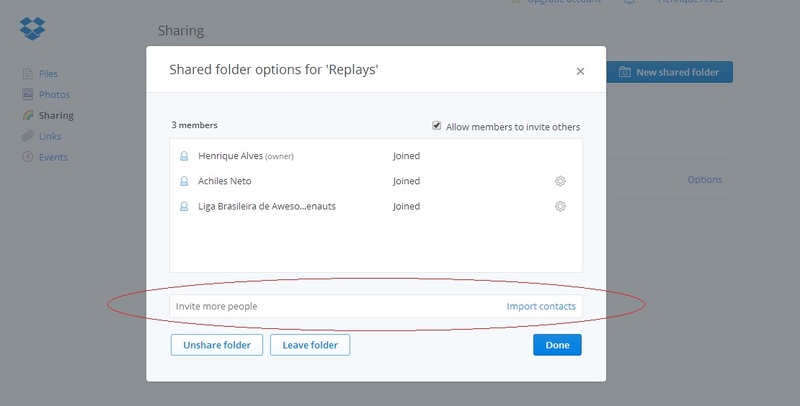 Well, as Joost said: The replay player recognises files that are newly added to the replay while playing. This can probably be abused to make a real-time spectator mode with a friend by mapping a folder on your hard disc to someone else’s replay folder on another computer. This is pretty technical but we think it should be possible. So me and a friend tried to sync our replays folder using dropbox and see if the sync is fast enough to see like a spectator. AND WORKS! Just wait 15s after the match starts and have fun with your spectator mode. Here's the tutorial. PS: On the preferences on dropbox app, you can set to sync only the replay folder if you have others folders on dropbox. 4 - Now go to dropbox site and click in "Sharing"
8 - Put the email of the friend who will share the replays with you and DONE! Now your friend have to do the same on his computer. After this you will see that as soon you start a match, a new folder will be created on replays sharing folder and 10s after you started your friend can start to watch your match. Last edited by Spotik on Fri May 16, 2014 7:12 pm, edited 3 times in total. Polish the OP up a little (not that it's bad) and I think you've got a sticky-worthy thread here. 1 - Only rename the folder of the current replay after the match ends. 2 - U can set the upload tax on dropbox to 15Kb and works great. 3 - I haven't tested the maximum amount of shared folders at the same time that may influence the ping somehow. But I believe that this is not a problem now. I'm pretty sure I should be able to get an online cloud/harddrive thing that's around 1 TB. Everyone could share their videos on this, so there are always videos to watch! Unless something has been changed since we tested in beta 2.4c a side effect is that it does not load the new files after starting watching. Awesome, really cool that you figured out a way to make this work so quickly! I specifically worked on making the replays recognise new files while playing, hoping this would work. And it does! I doubt the stream with 20second delay will expose anything except maybe for sentry's teleport.